If you’re here, then you’ve found the archives of Observations of a Nerd. This site is only an archive, and will not have live updates. Though you see it cheaply plastered across postcards and knick-knacks, aloha is a very deep and meaningful word in Hawaiian. Its exact origin is somewhat up for debate, though etymologists have said it comes from alo, which means sharing or present, oha meaning joy or affection, and ha, meaning energy, life or breath. In Hawaiian, it means everything from hello and goodbye to love, affection, compassion, and to be fond of something or someone. Yes, this post is about goodbyes and hellos. I am saying goodbye to ScienceBlogs and Observations of a Nerd. I have spent just over a year here at ScienceBlogs. When I was first recruited, I was ecstatic. I was to be blogging alongside powerhouses like Ed Yong, Rebecca Skloot and Brian Switek on one of the most prestigious science blog networks out there. In my mind, I’d made it big, even if I was just a small fish in a very big pond. Then came PepsiGate, stagnant checks, and a whole host of technical issues and managerial blunders that have marred the name of ScienceBlogs over the past year. ScienceBlogs wasn’t the network I’d hoped to be a part of, and somewhere along the way, I made up my mind to leave. The only question was when and to where, and when Bora took over Scientific American’s blogs, the pieces fell into place. Though the past year has been rough, I am not leaving ScienceBlogs with feelings of frustration or anger. Instead, I am leaving with aloha. I have learned a lot from my fellow sciblings and ex-sciblings, and I hold them in the highest regard. Mahalo nui loa to all of the bloggers here and elsewhere who have become my role models and friends. As Queen Lili`uokalani once explained, aloha is also “a recognition of life in another.” In saying aloha to ScienceBlogs, I also am recognizing the talent and vitality that is still here. I have no doubt that ScienceBlogs will continue to foster incredible science writing and writers, particularly in light of the new deal with National Geographic. I hope that this partnership will solve the issues that have plagued ScienceBlogs as of late, and allow some of the great lesser-known bloggers a chance to shine. Malama pono, all of you; I wish nothing but the best of luck to everyone here. But for me, it is too little, too late. I made the decision to leave before this deal, and I don’t regret that choice now. Aloha also means “to consciously manifest life joyously in the present.” As I say aloha and goodbye to ScienceBlogs, in turn, I say aloha and hello to my new home: Science Sushi, a part of the freshly launched Scientific American Blogs. I am unbelievably excited to be a part of the fantastic group of bloggers that the blogfather Bora has assembled. I hope that those of you who currently read my observations will join me as I set off on this new adventure. Though it’s a shiny new name on a shiny new network, it’ll still be the same old me and the kind of writing you’ve come to expect from me here. The new URL is: http://blogs.scientificamerican.com/science-sushi/ and the new feed is: http://rss.sciam.com/science-sushi/feed. Observations of a Nerd will move back to its ancestral blogspot home, and will serve as a back-up or an emergency place to post should all internet hell break loose. If you wish, update your feed, bookmarks, blogrolls, etc. I hope to see you all over at Scientific American! Recently, in a post titled “Ecologists: Time to End Invasive-Species Persecution”, Brandon Keim discussed a comment published in Nature which argued that the ecological community unfairly vilifies the various plants and animals we’ve transported around the globe. In some sense, the authors are right, at least as far as saying that not all alien species should be considered bad or needing removal. Straight from the beginning, though, the authors attack a dichotomy that doesn’t exist. They write that a “native-versus-alien species dichotomy” is counterproductive, and that new, pragmatic approaches are needed. This makes it sound like scientists and managers label every plant or animal as A or B, and those in A are allowed to stay and those in B are eradicated. To an ecologist, though, there is no “dichotomy” – there are a range of labels that apply to a variety of situations. 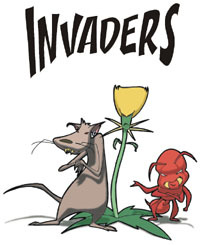 Specifically, there is already a strong distinction between invasive species and introduced, non-native or alien species – not to mention game species, fisheries species, etc. I don’t know of a single removal program that seeks to eradicate every species in an area that wasn’t there 100 years ago. Removal programs don’t target all “non-natives” – they target invasives. Invasive species get their own category, as well they should. They are specifically defined by the US government as “alien species whose introduction does or is likely to cause economic or environmental harm or harm to human health.” Almost half of the threatened and endangered species are at risk due to the impacts of invasive species. In the US alone, invasive species cause an estimated $140 billion dollars in environmental damages and losses every year1. Take the species I study: lionfish (Pterois volitans and P. miles). Lionfish were first sighted in the Atlantic in the late 1990s. In the past decade, they have become ubiquitous from Brazil to New York. They’re a classic invasive species: they grow quickly, breed year round, have no natural predators or diseases in their invasive range, and they are causing serious ecological damage. Studies have found they reduce the recruitment of larval fishes by 79% on average2, and they are causing a shift from coral dominated to algal dominated ecosystems3. The lionfish hardly stand alone. Hundreds of species from rats and mice to cane toads cause serious damage to ecosystems on a daily basis. So do we over-vilify invasive species? No, we don’t. The debate about invasive species really hits home in Hawaii, where 25% (maybe more) of the local flora and fauna aren’t just native, they’re endemic, which means they are found nowhere else in the world. It’s estimated that somewhere around 25 new species are introduced to Hawaii every year, but thankfully, most of these do not become invasive. Indeed, of the 13,000 or so species of plants that have been introduced to Hawaii, only about 1% are considered invasive. Those that are deserve the title and the removal efforts that tend to go with it. When invasive species take over natural habitats in Hawaii, they very directly and quickly drive species towards extinction. Not surprisingly, Hawaii has a number of invasive species removal programs targeting species that are or might be a problem. I couldn’t believe the authors chose to picture Miconia (Miconia calvescens) removal in Hawaii as their lead image, especially since they then didn’t even bother to talk about it. Yes, a lot of effort is spent preventing the spread of Miconia in Hawaii, but it’s for damn good reason – all Hawaiian biologists and managers need to do is take a look at Tahiti, where it’s referred to as “green cancer”. A single Miconia was introduced to Tahiti in 1937. Within a half a century, the plant took over. By the 1990s, the plant had spread to 70% of the island’s forested areas, over a third of which were near monotypic, meaning the Miconia had out-competed and overrun all the other native species of trees4. On Oahu, Miconia has not had that kind of impact because we have actively prevented it. If we were to stop these removal efforts, there is little doubt that Miconia would spread. One study estimated that it would take less than a century for Micona to take over Oahu like is has Tahiti5. That study also estimated what would happen if we stopped control efforts for the next 40 years; the cost of doing nothing, based on loss of native habitat and species, changes in watershed properties, and other ecosystem damages would be $627 million. This is the species that Davis and his colleagues chose as the front image for saying we unnecessarily persecute non-native species? But, of course, the authors don’t talk about Miconia, or any of the removal programs in Hawaii. They instead cherry-pick their examples, cite their own work, and ignore the vast majority of the science from the past ten years which supports invasive species management. I wouldn’t be so bothered by this short essay, except that more than ever, management programs need to be supported. If only the authors’ claim that there is “a pervasive bias against alien species that has been embraced by the public, conservationists, land managers and policy-makers” were true. But sadly, many politicians and people just don’t care. Just earlier today, my grandfather was watching a Fox News segment called “The Money Hole“, in which John Stossel started ranting and raving about all the ways in which the US wastes tax payer money. One of his examples? The $500,000 spent on removing brown tree snakes from Guam – one of the nastiest invasive species around, responsible for the extinction of ten out of the twelve native bird species that once lived there as well as a slew of other damages. I’m actually shocked this paper was published by Nature. I’m even more shocked such an essay wasn’t peer-reviewed and the authors were paid for it. Of course, I generally would find it hard to trust an essay where the vast majority of the cited papers are written by the coauthors, and those that aren’t are outdated by a decade. How can they deride the management plans currently in use when they don’t actually evaluate the current efforts? By dishing out blanket criticisms towards all invasive management programs, the authors provide fuel to the fire of those who attack environmental work on a daily basis. Conservation programs and scientific agencies which study the practicality, necessity, and effectiveness of them are already first on the chopping block when budgets are cut. They’re struggling for funding in these harsh economic times, and articles like this one only seek to unfairly undermine their credibility when they need it most. Scientific American Guest Blog: Seratonin and Sexual Preference: Is It Really That Simple? Starts With A Bang: Where Is Everybody? Sadly, no, neither of my posts made the cut. It was some tough competition! Be sure to read all of these, and I’ll tack on to this post who takes the Top Quark when it’s announced in a week or so. After day after day of me urging you to vote, the results are finally in for the Semifinalist round for the 3 Quarks Daily Science Blogging Prize. Some great posts have made the cut – including these ones by Scicurious, Evelyn Mervine, Allie Wilkinson, Brian Switek, and those Southern Fried Boys. Thanks to you and all your votes, TWO of my three posts are in! Both “Why Do Women Cry” and “How Do You ID A Dead Osama Anyway” are among the top 20. I’m so grateful for all of your support – I don’t think anyone has ever gotten two posts in before! In a couple days, the crew at 3QD will be posting their short list of six to nine finalists, which they will then pass off to Lisa Randall. The winners, chosen by her, will be posted sometime around June 21st. Thanks again, and I’ll keep you posted as the results come in! From the Archives: How Do You ID A Dead Osama Anway? If you didn’t already know because, by chance, you missed my tweets, posts, and facebook updates, there is a science blogging contest going on RIGHT NOW. The 3 Quarks Daily Science Blogging Prize is currently narrowing down the top 20 posts from 87 nominees. To get through the gauntlet, a post has to get enough votes. Rather than remind you again to vote for Observations of a Nerd, I figured I’d show you why you should. Over the next 24 hours, I’ll be reposting the three posts in the competition in case you missed them the first time. If you like them, and haven’t already, cast your vote! Osama Bin Laden is dead. At least, that’s what we’ve been told, and I tend to believe such things. But how do they know it’s him? Well, they have the visual evidence and the body, for one. But to be certain it’s not a look-a-like, the government has taken steps above and beyond to make sure they’ve got who they think they have: DNA analysis. Now, I’m not entirely sure what DNA analysis has been done, but I can say this for certain – whatever method they used could be completed in a matter of hours given a lab ready to go and focused solely on this. Using commonplace PCR methods – which, for the record, is what I use in my lab every day – Bin Laden could easily be ID’d faster than you’d think. Heck, I can get DNA from a fish and turn it into sequences or genotypes in 24 hours, so I think the US government can work faster than me when time is of the essence. Allow let me explain how they could do it so quickly.